Nadia Sadouski, left, and Jelera McMullen in the GISS shop. Students at Gulf Islands Secondary School demonstrated their work over the past year at the GISS shop class showcase event on Thursday. Tables were laden with handmade knives, metalwork and woodworking projects, all made by students in the shop class at GISS. The showcase was a chance for local trades workers to see the skills and projects of the students in the class, as well as to meet the students and talk about their projects in an informal setting. The event was facilitated by the Construction Foundation of B.C. The event takes place during exam season every year and gives students a chance to show off what they’ve been working on for the past year. Typically, only completed projects are showcased at the event, but this year was the first year to have a live blacksmithing demo. Blacksmithing was introduced to the program last year, after more space opened up in the shop expansion. “We got the forges going this year, so we thought it would be a good idea to give everyone a live example,” said Jelera McMullen, one of the blacksmithing students at the demo. 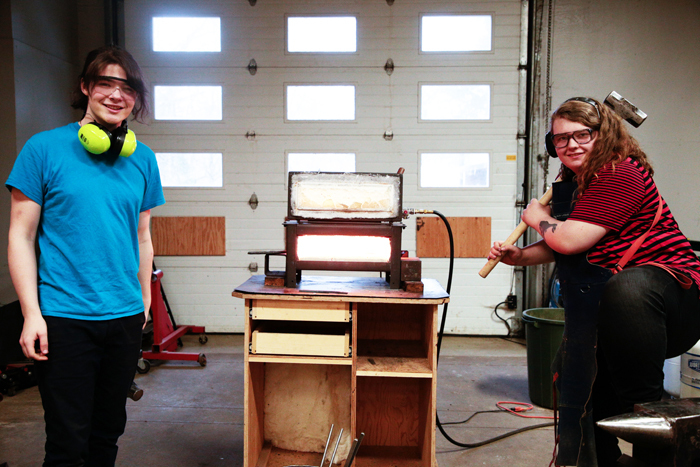 McMullen and Nadia Sadouski are Grade 12 students who have been working in the blacksmithing side of the shop program since the shop got its first forge last year. The two are already selling their work online and at local markets, and plan to collaborate after graduation. For more on this story, see the Jan. 30, 2019 issue of the Gulf Islands Driftwood newspaper, or subscribe online.